Ukrainian President Viktor Yushchenko and Prime Minister Viktor Yanukovych reached an agreement on holding early parliamentary elections. The agreement is a major victory for Yushchenko, whose April 2 decision to dissolve parliament and call early elections was a huge risk and looked in danger of backfiring as the crisis dragged on. But while Yushchenko won this battle, the real fight for control over the next parliament still looms, and all polls show pro-Western Yushchenko's parliamentary allies trailing Yanukovych's more Russian-leaning party. Yushchenko called the agreement "the answer that the nation was waiting for." "I would not like for what happened today to be understood as the victory of one force over another," he said. "Undoubtedly, common sense ... prevailed." After emerging from talks with the president, Yanukovych went to speak to thousands of flag-waving supporters gathered on Kiev's Independence Square. "There is no other way to solve this crisis except by holding democratic and fair elections," he said. The ex-Soviet republic has been mired in a political crisis since Yushchenko's decree _ a move he said was necessary to prevent Yanukovych from usurping power. Yanukovych and his majority in parliament ignored the decision, calling it unconstitutional. As the standoff dragged on, both sides brought their supporters to the streets for major rallies, and accused each other of acting in bad faith. Yanukovych appealed to the Constitutional Court, but the court moved slowly in its deliberations and Yushchenko said the 18-judge panel was not up to the task, firing two of the judges this week. Yanukovych emerged from a meeting with the president Friday to say a breakthrough had been made. He told thousands of his supporters at an outdoor rally that the two leaders agreed to the creation of a working group that will decide what laws need to be adopted and when the election will take place. Previously, Yushchenko had set the election date for June 24. The bloc of former Prime Minister Yulia Tymoshenko and other pro-Western parties welcomed the agreement, as did many of Yanukovych's supporters gathered on Independence Square, saying that they supported their leader. "It is correct because the longer this lasted, the worse it became," said Svetlana Piven, 40, as thousands of Yanukovych supporters rallying on the square began to disperse. "Yanukovych will prove that he was right and the people will support him." The working group that will propose the election date was given a Monday deadline to present its suggestions on how to proceed, Yushchenko said. He acknowledged that parliament would have to reconvene to approve changes to election law and this year's budget to release funds for the election, but said he thought that could be done in one day. He suggested that could happen Tuesday, saying he would be present in the chamber hall to immediately sign the bills into law. After that, Yushchenko said the election would likely take place within 60 days meaning the vote might come in early July. Yanukovych, however, told Russia's Rossiya television that the vote should not be held before autumn, and suggested he favors an October date. Yanukovych had repeatedly said he would not agree to early parliamentary elections unless a presidential vote was held simultaneously, but neither leader mentioned a presidential vote Friday, suggesting he backed down on the demand. Analysts said that Yushchenko cleared a tough hurdle by winning Yanukovych's agreement, but that the hard work for the president now lies ahead uniting the still fractious pro-Western parties. "Now he has to win the election that is going to be much, much more difficult than getting Yanukovych to agree to parliamentary elections," said political analyst Ivan Lozowy. "At this point, there is no reason to believe (Yanukovych's) Party of Regions won't repeat their past performance of a year ago or even exceed it." 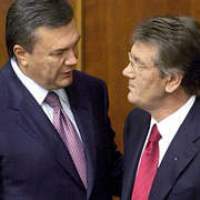 The tension between Yanukovych and Yushchenko had been building since the Party of Regions won the most votes in March 2006 parliamentary elections and formed a majority coalition, helping Yanukovych return to power. The two men have a long history of rivalry, having faced off against each other in the bitter 2004 presidential election that sparked the Orange Revolution. Yushchenko won a court-ordered repeat vote that followed massive street protests over alleged fraud after Yanukovych was initially awarded victory in the election. Yanukovych said the parliamentary election would show which camp has more popular support. "Those who like elections, who initiated them, will get an answer from you about who today must be in power in Ukraine," he said to applause from supporters.